In daylight hours outside of October 31st, though, these resting places for the dead are actually a favorite of mine to visit -- even to have a picnic. My travel agendas often include finding a local graveyard, right alongside touring famous museums, monuments, and neighborhood cafes. Nope, I'm not a particularly morbid person, nor do I relish getting scared (note: I really really don't). But I find them to be places of beauty and memory, filled with interesting carvings and cultural turns. I follow in history's footsteps, when graveyards were initially integrated right into the city fabric and, later in the 1830s, became the first "rural" public parks. While living in Boston, the Tall Man and I were briefly members of the Boston Athenaeum, one of the country's first membership libraries. 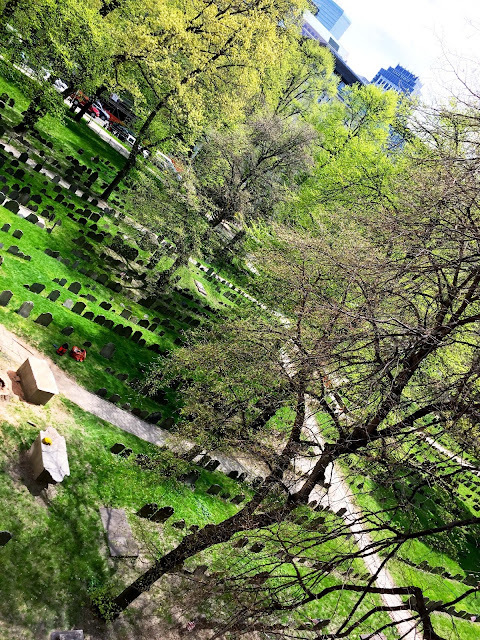 From its quiet nooks several stories up, I had a tranquil view of the Granary Burial Ground, a major landmark along the historic Freedom Trail. Established in 1660 on a patch of ground that used to be part of the Boston Common and grazed by cows, it is home to an estimated five thousand people despite having only 2,300 grave markers. Apparently the graves were rearranged in more orderly rows in the 1800s, supposedly to make lawn mowing easier. Famous colonists like John Hancock, Paul Revere, and Samuel Adams are buried here, alongside victims of the Boston Massacre and unnamed infants. Now that I've moved from Massachusetts, I regret not wandering much among the slate headstones. On an architecture studio trip in 2010 (which I wrote in brief musings here, here, and here), we visited Kyoto and were surprised to find this cemetery right next to the street. 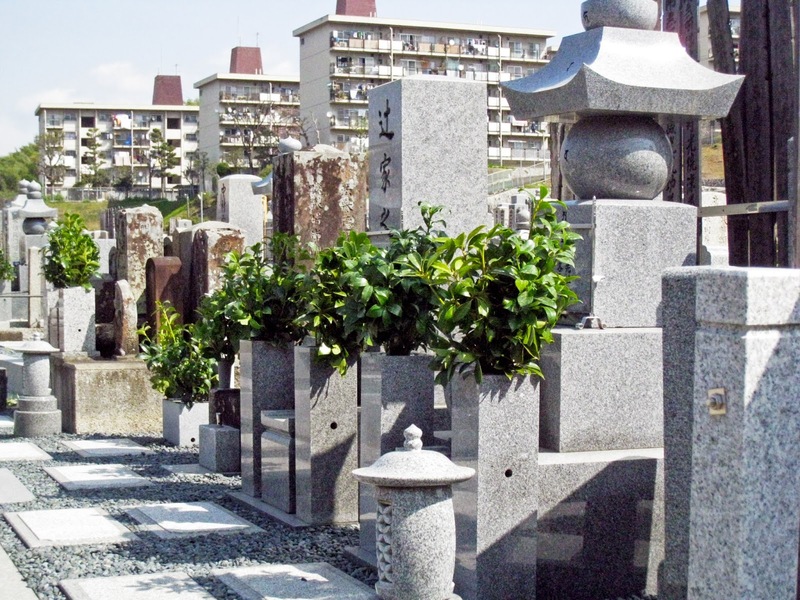 No fence, no warning signs, just marble and granite headstones neatly lined up one right after the other in stepped platforms. 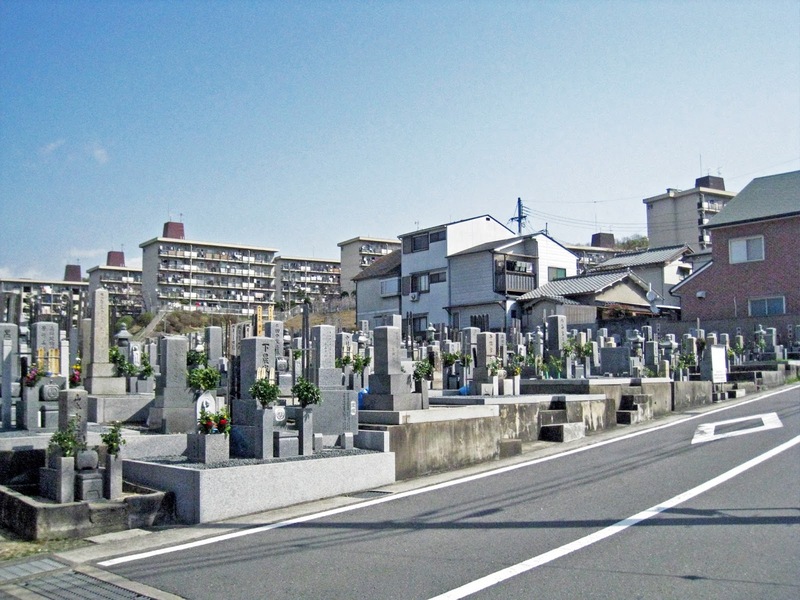 It wasn't clear how old the place was, but what was evident was the economy of space: in an island nation like Japan where land is scarce, graves are packed tightly and even stacked vertically in the ground. It was also an incredibly neat place, with no dead leaves or refuse left behind, only well-trimmed green branches and the odd stick of incense. Traditionally on shunbun no hi and shubun no hi, the spring and autumn equinoxes, relatives will come and clean the family plot. I had thought Edgar Allan Poe was more of a Philly and New York kind of writer, but realized I was sorely wrong when I visited Baltimore for a friend's wedding. When I spotted Edgar Allan Poe's grave marked in Westminster Hall and Burial Ground on Google Maps, I made my group of friends come with me to pay homage to the master of macabre. He lived on and off in the city throughout his wandering life and, in 1849, was buried in an unmarked tomb. 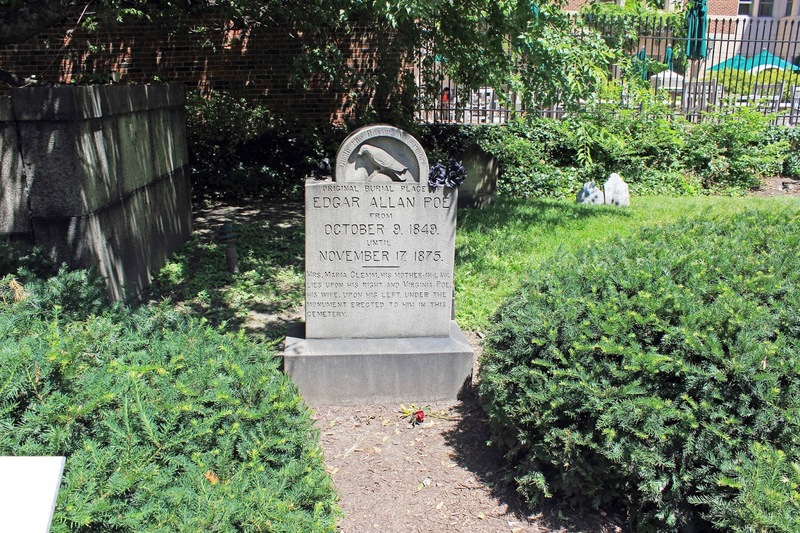 The graveyard that houses his remains and memorial was originally established in 1787 as part of the First Presbyterian Church of Baltimore, continuing the traditional association between churches and burial grounds that began with the rise of medieval Christianity. 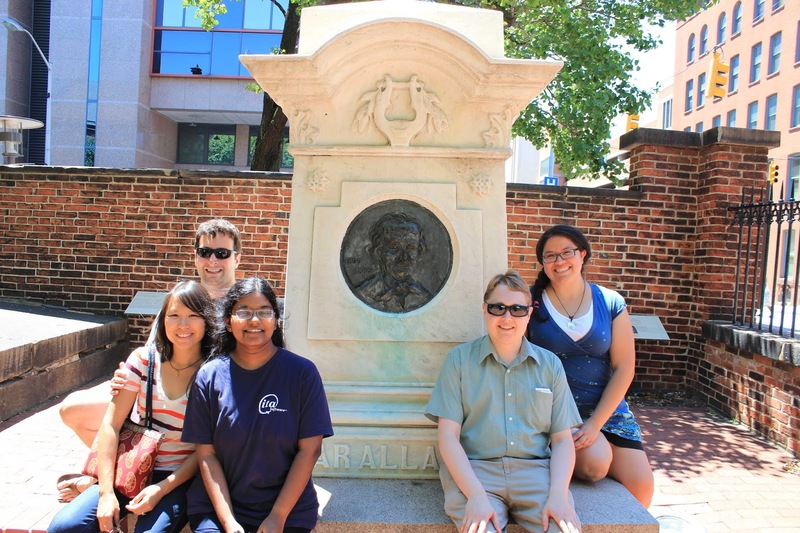 Over the course of time, Poe was given a headstone, then a monument designed by George A. Frederick, the architect of Baltimore's City Hall. Poe is clearly the star in this cemetery, where his grave markers stand tall over the others that are somewhat overgrown. Greyfriars Kirkyard, one of five historic cemeteries in Edinburgh, is supposedly the most haunted cemetery in the world, but during the day it was tranquil enough if not a bit morose and, yes, a little creepy. The Tall Man and I were in Scotland for our honeymoon and discovered this site on a walking tour of the Old Town, as the historic section of the city is called. Similar to Granary Burial Ground, Greyfriars was established in the 1560s as an expansion site for the growing demands of Edinburgh. Only the richest families could afford to be buried in this former Franciscan monastery, and the many carvings and wall monuments are testament to this wealth. Our tour group was pretty quiet while wandering the graveyard. It was an overcast day, having rained earlier on, and the weather added to the dampened atmosphere. 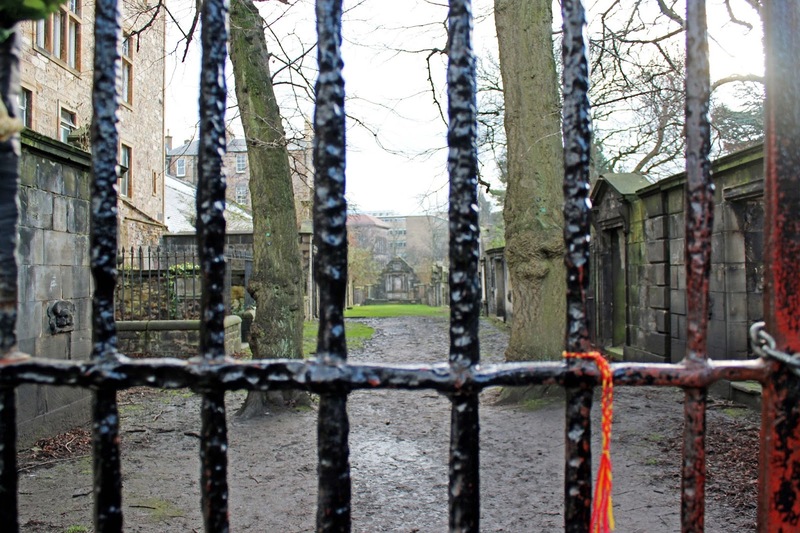 Seeing the Covenanters' Prison further added to our mood, when we were told that some 1,200 Covenanters, resistant to English meddling, had been imprisoned and tortured there. BUT let's end this part on a lighter note. 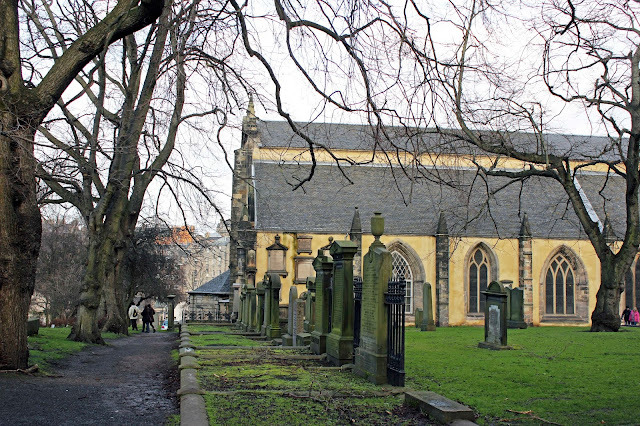 The kirkyard is also known for a sculpture of a Skye terrier honoring the Greyfriars bobby, a dog who loyally guarded his master's grave for 13 years out of mourning (or for the snacks he was given -- either way, it's a nice story). Writer J.K. Rowling had also garnered inspiration for some of her characters here, like Tom Riddle and Mad-Eye Moody. On another leg of our honeymoon, the Tall Man and I wanted to visit a cemetery (yup, again an agenda item) but didn't feel like making the hike out to the largest of them, Pere Lachaise. 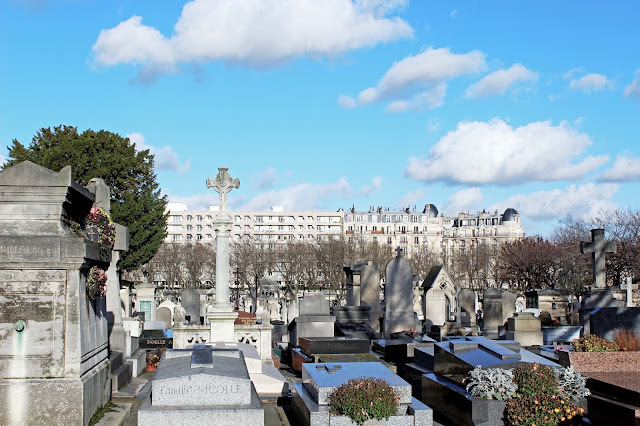 Happy coincidence, then, to realize that the Cimetière de Montparnasse was just a stone's throw from our hotel! It was a peaceful place with few tourists on that wintry afternoon, which suited us just fine. 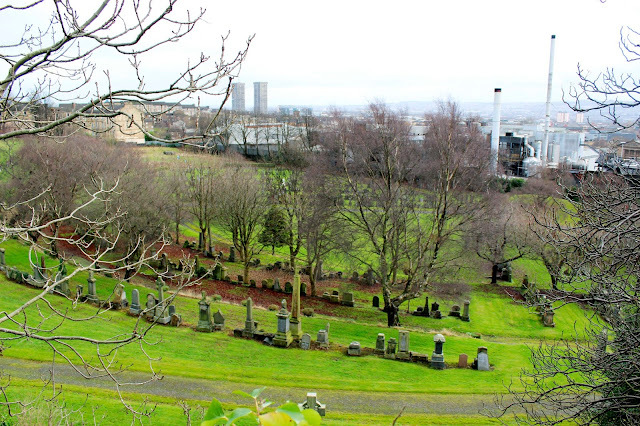 While the cemetery blends right into the fabric of the city, that wasn't the case when it was established in 1824. Back then, the new gravestones stood on farmland well outside Paris city limits, when burial sites were banned from the city due to disease and paltry sanitary conditions. It was also just getting darned expensive to have the living competing with the dead for real estate. 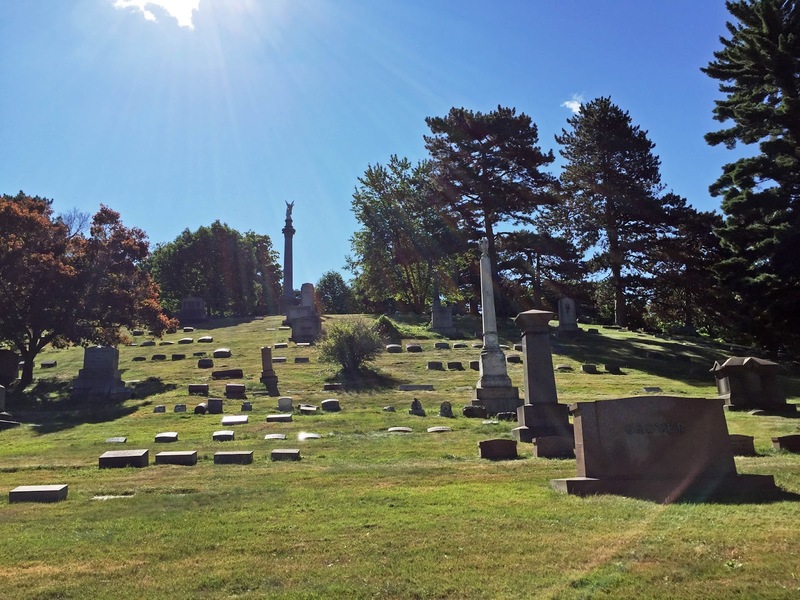 The push into the countryside, though, gave rise to the rural or garden cemetery -- what we recognize most readily as a cemetery today, with pastoral vistas and winding paths leading among trees, graves and monuments. That day, we took a leisurely stroll in the vein of the flâneur, the lounging wanderer often mention in Charles Baudelaire's poetry. 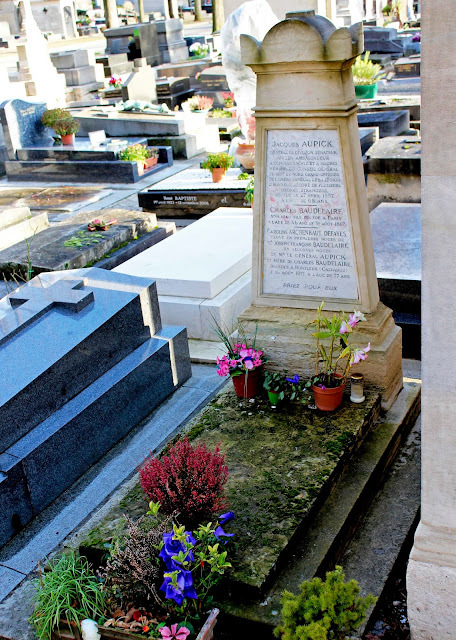 He is among the many literary and artistic elite reposing in the cemetery, along with the likes of playwright Samuel Beckett and philosopher-writers Jean-Paul Sartre and Simone de Beauvoir. Wouldn't you want to visit a cemetery that is called a necropolis? I would -- and I did. The Tall Man and I made the long trek over to first see the Glasgow Cathedral before walking across the footbridge to the Glasgow Necropolis. It truly looks like a city of the dead, with graves winding their way up the hillside and many an ornate mausoleum crowning its crest. Its wandering paths and expressive carvings seemed to truly embody the romanticism of the Victorian era. 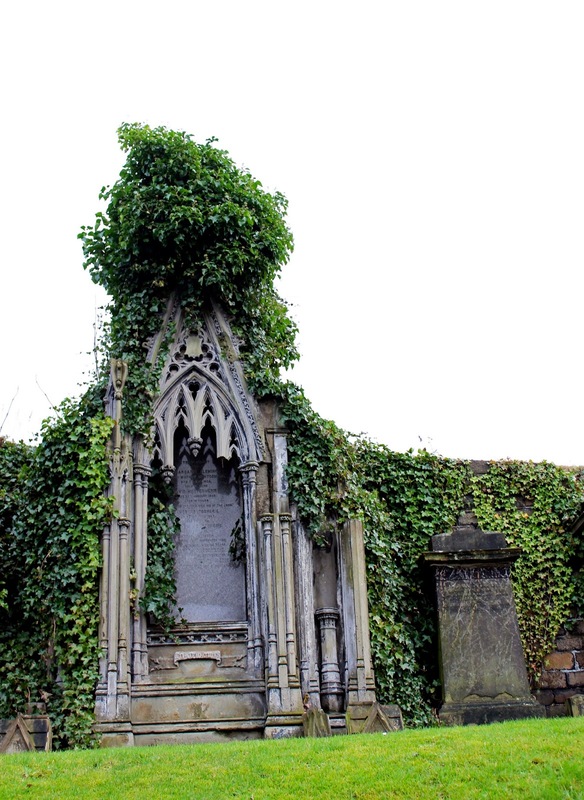 Conceived in 1831 and inspired by Paris' Pere Lachaise, this was another "garden cemetery" -- but because of its location in a less dense area of the city, and the disrepair of many of the graves, it conjured up a sense of the wild countryside while in the midst of Glasgow. There is a large obelisk honoring Scottish theologian John Knox, although he isn't buried here. (He's actually buried in an Edinburgh parking lot ... no joke. I can post a photo.) 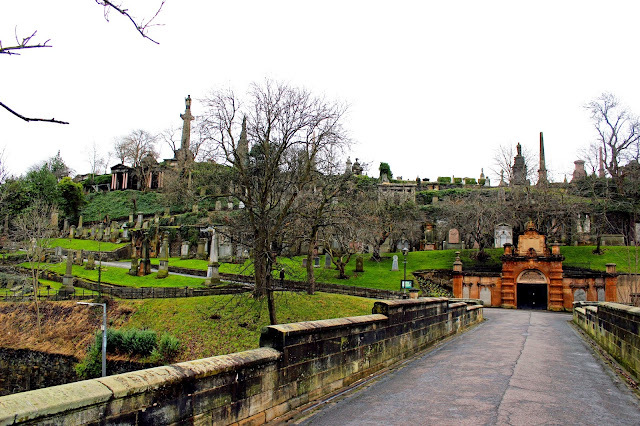 This cemetery -- or necropolis -- isn't so much an attraction for its famous residents, though, but for its atmosphere and view. It's probably one of my favorites. Last summer, the Tall Man and I went on a zigzagging road trip from Los Angeles to Philadelphia. On days 13 and 14 -- the homestretch! -- we visited my friend Jackie and her family and had a short but lovely time with them. When they asked us if we planned on seeing any sights on our way to central Pennsylvania, I'm sure they expected us to say something about the Rock and Roll Hall of Fame or some other notable museum or site. 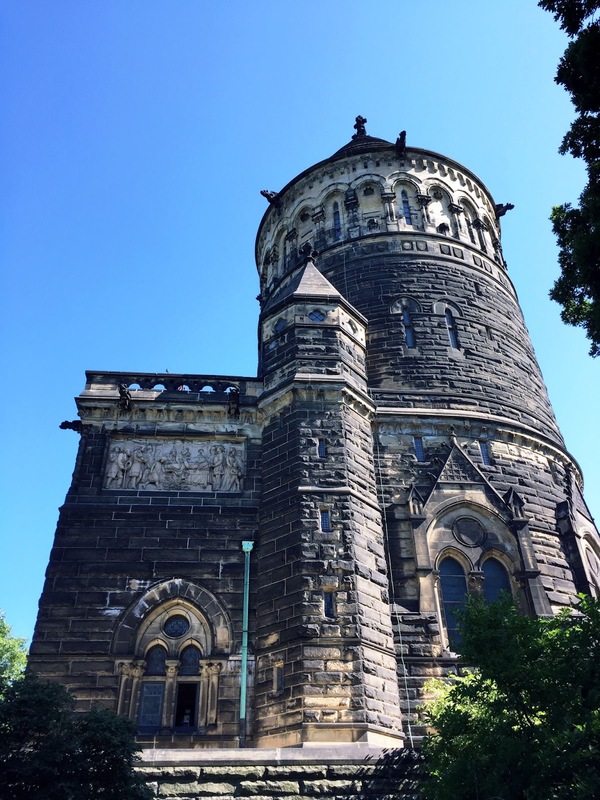 But we surprised them by setting our course for Lake View Cemetery, destination: President James A. Garfield's Memorial. By now you might be wondering how many dead people we can tolerate seeing after all these trips, but rest assured, our threshold is high. The cemetery, founded in 1869, is huge so we saw most of it by driving along its winding roads. Again, in the spirit of the traditional garden cemetery (as inspired by the first American one, Mount Auburn Cemetery outside Boston). While there were many sculptures and monuments scattered through the park-like grounds, Garfield's sandstone tomb towered above them all. The inside is richly decorated with mosaics and carved stone surrounding a triumphant-looking statue of the president, no subtlety here. And as a funny aside, this cemetery has the best motto, which I just discovered while writing this piece: "Grounds for life." No trip to Scotland is complete without a sojourn into the Highlands, so on the aforementioned honeymoon, the Tall Man and I took a train up the western coast and settled back in Fort William. This time, we were NOT looking for a cemetery, but it found us. 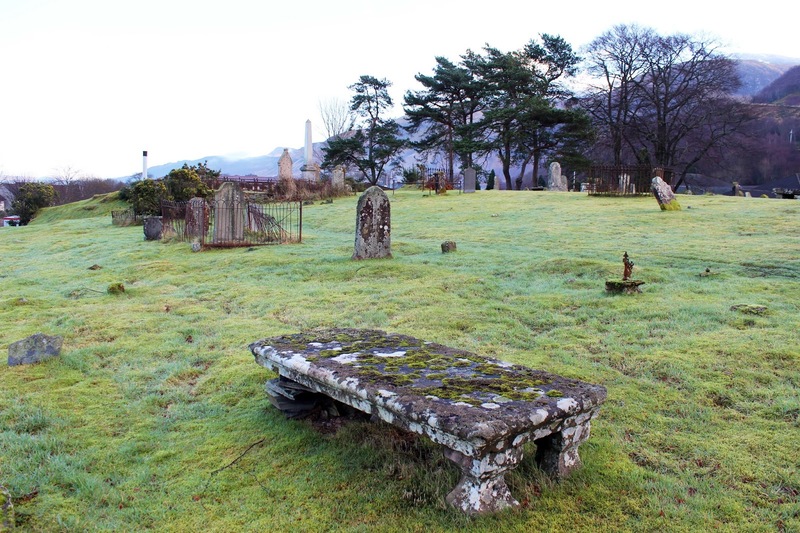 Our sights were actually set on the Ben Nevis Distillary, and our walk happened to take us through the Craigs Burial Ground. I didn't know the name at the time nor what it was for, but that seemed fitting for the wildest cemeteries of all. You could just picture black-faced sheep wandering into the photo above, munching on the long grass swathed between moss-covered tombs. There seemed to be little order in this graveyard: headstones leaning this way and that, graves lying stark alone or in twos and threes. Wandering in Scotland made me obsessed with moss and lichen. Example above. Later, I learned that the grounds were established around 1690 for the military fort that once stood there. 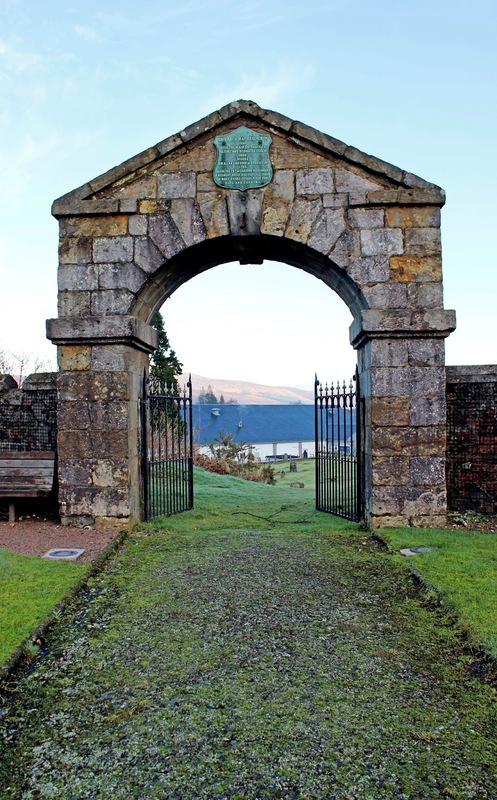 The gateway was once the fort's entrance. 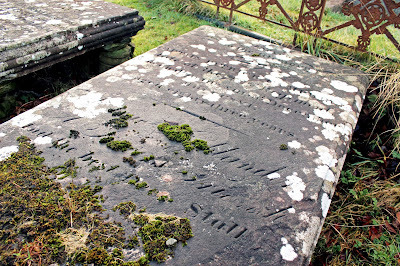 There's a monument to poet Ewan MacLachlan, but otherwise many of the site's occupants remain relatively unknown, with many of their names partially or fully obliterated by time and Mother Nature. I'll end with this silent marker. 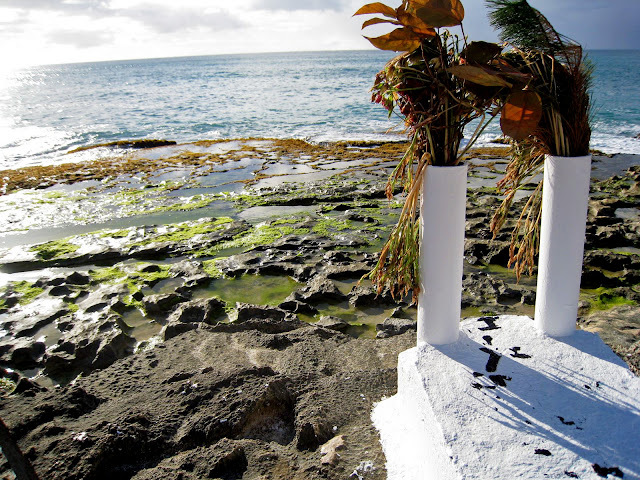 It doesn't reside in a cemetery, but stands as a solitary soul, somewhere along the western coast of Oahu, where Hawaii's capital city resides. This might be Yokohama Beach, but I'm not totally certain. On my last day in Hawaii, after celebrating the marriage of two dear friends, my travel companion Allen and I decided to drive as far as we could along the coast. We learned, though, that there is no continuous road all the way around the island: the asphalt eventually petered out, and without a 4-wheeler, we were forced to turn around. But first, we spent some moments at the beach, marveling at the strangely worn rocks and the sea stretching as far as the eye could strain. The name on this grave had been worn away by the rain and sea, but the flowers stood as a solemn reminder of the life that had been. or do they give you the creeps? Are there others that you would recommend I visit? The world is wide even yet.